A new record has been set for the world’s deepest fish, British researchers have announced. The bizarre-looking creature, which is new to science, was filmed 8,143m beneath the waves, beating the previous depth record by nearly 500m. Several other new species of fish were also caught on camera, as well as huge crustaceans called supergiants. The animals were discovered during an international expedition to the Mariana Trench, which lies almost 11,000 meters down in the Pacific Ocean. The 30-day voyage took place from the Schmidt Ocean Institute’s research vessel, Falkor, and is the most comprehensive survey of world’s deepest place ever undertaken. The Hadal Ecosystem Studies (Hades) team deployed unmanned landers more than 90 times to depths that ranged between 5,000m and 10,600m. They studied both steep walls of the undersea canyon. The University of Aberdeen’s Hadal Lander – the UK’s deepest diving vehicle – recorded more than 100 hours of deep-sea footage. Until this expedition, the deepest fish had been found in the Japan Trench, also in the Pacific Ocean. 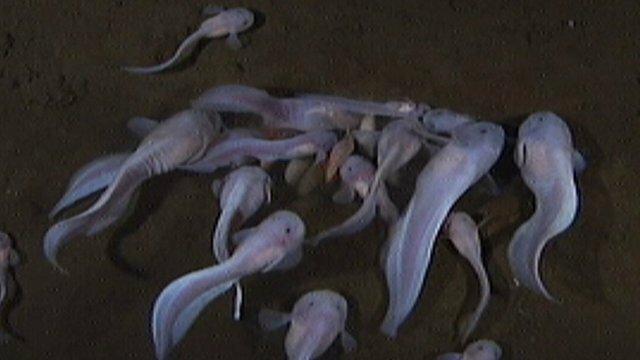 A 17-strong shoal of pink, gelatinous snailfish (Pseudoliparis amblystomopsis) were recorded 7,700m down. The team thought they had broken the deepest-fish record, but then another pale pink species came to feed at the lander, which is loaded with bait, even further down at 8,143m. Without catching the fish and bringing it back to the surface, the team is unable to confirm that it is a new species. The new record-breaking creature is close to the depth-limit at which scientists believe fish can survive.